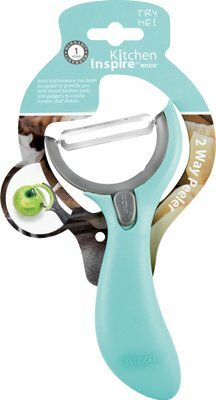 The Inspire 2 Way Peeler is ideal for peeling a range of food items. The Peeler has a Swivel and a Y Shaped blade. To use the Inspire 2 Way Peeler simply pull down grey lock on handle, twist the required blade frame into position and release lock once blade is clipped into place. Maintenance and Care: Pull grey lock on handle down Twist required blade frame into position and release lock once frame is clipped into place Suitable for the dishwasher.